Meister Stroemungstechnik is manufacturing company and service provider in one. It is our commitment to ensure that all goods and services provided meet the standards that have been assured. Together with the customer, we analyze the individual requirements and view ourselves as partner, whose personal influence will optimize performance. 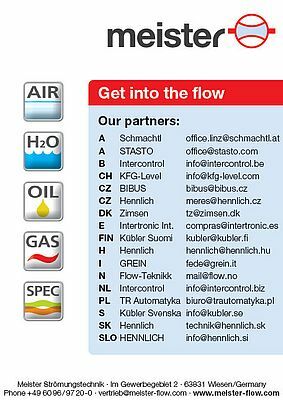 Meister Strömungstechnik is a worldwide operating manufacturer in the field of flow measurement technology, products include: flow monitors, indicators for liquids and gases and flow meters They offer solutions for future-oriented energy efficiency.